As part of our rebuilding program, we are working with Helping Hands 4 New Generation for rebuilding communities. We are building 450 huts for 1900 people in two villages in Bogalay Township, both reachable by 1 and half hour boat ride from Bogalay in delta region. While the death toll in these two villages are little, the houses and all possesions were lost during the cyclone. 1. 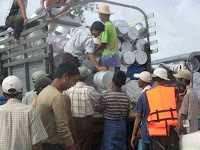 Donating rain shelter sheets (450 sheets) and helping them build the huts together with the villagers' efforts. 2. Donating necessary house building tools such as nails, pliers, hammers, copper cables. Some concerned parents share their worries with us about the mosquito situation in the villages. A tropical country like Myanmar is no stranger to mosquitoes and their stinging bites. But after the cyclone, amount of mosquitoes present in the villages are high due to rotten trees and mud holes around the villages and in the river banks. While the mobile medical teams and some NGOs have arrived to these villages and sprayed some insecticides, the mosquitoes have returned back and parents are worried about their children. When we were in the villages, there were no reports about dengue fever yet. 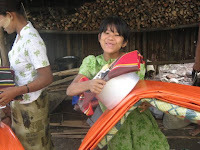 To protect the children, we need mosquito nets that are treated with repellent liquids, and other insecticides. Another difficulty the villagers are facing, in addition to other major challenges such as making their livelihoods, is lack of boats. Delta region has numerous rivers, creeks, and streams. In pre-Nargis days, a well to do family would own a motorized boat, a normal family would own a rowing boat, it is normal that most families had boats. 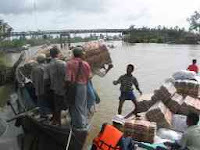 Without a boat in delta region, their communication with a nearby town is quite difficult. This lack of boats was the reason why some people in the remote area had to suffer without any proper food for longer period than other people. A boat can cost from US$ 75 (normal rowing boat), US$ 150 to US$ 1,300 depending on their size, engine power, and type of wood used. We will not be able to provide the boats for the families now, but let's just keep this in our mind that there is such challenge exists that we have to tackle when the time is right. More detail report will follow again when the huts are completed. Purchased and Distribution: Please click here for detailed distribution and areas reached. Thank you very much for your generosity and support. Together, we can make a difference. There are rehabilitation programs being carried out by various parties including some heavy-weight companies in all parts of delta region. The farmers are being helped with buffaloes or plowing machines, seeds and manpower. Yet, there are always some pocketed areas where help could not reach as fast as it should. All of us can try filling in these blanks and help others do this as well. That said, it was reported that in 10 villages visited in Day-da-ye area, there are 6 primary school (Grade 1 to 5), 3 extended primary schools (Grade 1 to 8), and 1 high school (Grade 1 to 11). Total number of students in all these schools is around 2,000. Some are still coming in to register in the schools at a later date, so the number still fluctuates. All these school buildings had collapsed during the cyclone except the buildings from the high school. 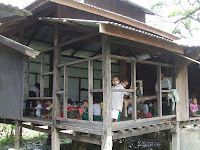 All the students studying in primary schools are in the shelter of monasteries in the villages. As schools have started, some text books have arrived to the high school, but most of these text books got wet and were destroyed. Other primary schools have not received any text books yet. 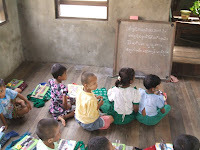 You will see in the pictures: the teacher uses a game board as a blackboard; some students are in a shelter house (za-yat) without any walls; and some are studying on the concrete floors. We will have an assessment report on the number of students in each grade by next week. One set of text book costs between 1,000 Ks per set to 1,500 Ks depending on the grade. Let's try filling in the blanks.